The Facebook listening app. Photo credit: Facebook. Facebook United States engineer Gregg Stefancik has responded to media reports that the company will soon be 'listening' to its users via their smartphone’s microphone. In the US, the social media giant is planning to introduce an Android and iOS app that will allow US users to share and discover music, TV shows and movies. However, if users allow Facebook to access their smartphone’s microphone while they’re writing a status update, the company will identity the content playing in the background and automatically include it. The app is similar to the Shazam smartphone app which uses a person’s smartphone microphone to identity songs that are playing on the radio or at a live concert. The app will be available to US users in coming weeks. However, Facebook has no plans to roll out this feature to the rest of the world at present. An online petition complaining that the app is a “threat to privacy” has received more than 500,000 signatures from Facebook users. In response, Stefancik told a media briefing in Sydney that here are a “lot of myths” about the proposed app. “The way this feature works is that when the user goes to post a status update, they have the option of recording 15 seconds of audio. We are not doing this without user consent, the user has to ask if they want audio recorded,” he said. According to Stefancik, the audio fingerprint it receives is “disposed of immediately". He added that the data about the song, TV show or movie match is only stored if the user posts an update. Stefancik also pointed out that the smartphone microphone does not get turned on automatically because the app will ask for the user’s permission first. “It’s not always listening and the app is very limited in what it is sampling. I wouldn’t want this in my pocket either if it was recording everything going on around me," he said. 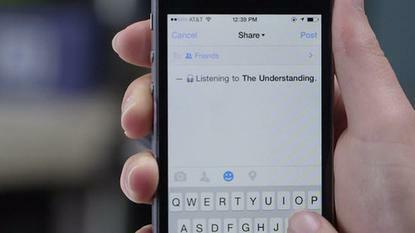 Facebook has issued a blog post about the app in response to user concerns.